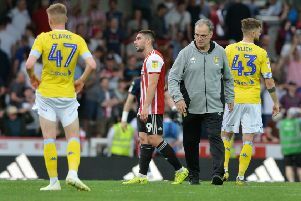 Injured Luke Ayling receives treatment on the field during Leeds United's game with Nottingham Forest and is now out for the season. After their latest FA Cup embarrassment the pressure is on now for Leeds United to deliver when they return to the Sky Bet Championship this Saturday. There are no excuses for not delivering a performance at Ipswich Town with most of the first team rested from the cup tie at Newport. Head coach Thomas Christiansen took the chance to make nine changes from the side that started the previous game against Nottingham Forest and he will be looking for the players to make the most of their rest as the Whites look to stop a bit of a rot developing with three games now without a win – and only one goal in those matches. With January not proving the best of months for United in recent years it is not a new experience for the club, but they know they cannot afford to let the cup disappointment spread into their league form if they are to maintain their current top six position. They will be tested by an Ipswich side with their own ambitions of reaching the play-offs and who will feel they owe United after losing a close game 3-2 at Elland Road back in September in the first meeting between the sides this season. Both teams were playing better football then they have of late with Ipswich having also gone out of the FA Cup last weekend after losing their previous two league games so it will be pressure time for each to rediscover their touch. Ipswich boss Mick McCarthy left a few out for their cup match, but did not go as far as his Leeds equivalent, who was accused of taking the competition too lightly. Christiansen will point to the tough schedule over the holiday period for major reasons for making so many changes for the cup tie. He also took the chance to experiment with a different formation, although the 4-4-2 was not too successful. He did find some things out, particularly that United do not appear to have a huge amount in reserve. None of the fringe players took their opportunity to force their way into the first team picture. In defence, Cameron Borthwick-Jackson was taken off after failing to impress at left-back – making his loan deal look increasingly likely to end this month – while Conor Shaughnessy’s mistake for an own goal gave Newport their equaliser. Midfielder Mateusz Klich worked hard defensively, but was no threat in the other half of the field and has still to deliver in a Leeds shirt. Wide men Hadi Sacko and Pawel Cibicki flattered to deceive and up front Jay-Roy Grot once again came in for heavy criticism from fans after looking no more than raw. He must clearly show more in training to have been given so many chances in the first team – he has now made 14 appearances. There was one success with Gaetano Berardi showing that he offers another option as he was handed a centre-back starting role for the first time and acquitted himself well. He will not be needed there for this Saturday’s game with Pontus Jansson back to play alongside Liam Cooper, who was a second half substitute at Newport. But he is likely to be selected at right-back with news that Luke Ayling has been ruled out for the rest of the season after having ankle surgery. The 26-year-old suffered an injury when caught in a tackle by former Leeds player Liam Bridcutt in the 0-0 draw with Nottingham Forest on New Year’s Day. The injury setback follows on from the loss of Samuel Saiz to a six-match suspension for spitting at Newport County midfielder Robbie Willmott during Sunday’s FA Cup third-round defeat at Rodney Parade. Midfielders Ronaldo Vieira and Eunan O’Kane also face fitness fights to be ready for the Ipswich trip. However, Leeds could have a fresh face in for the game as they are close to signing Club Brugge left-back Laurens De Bock.